On December 14, the Lifetime holiday movie Christmas Around the Corner will debut at 8 PM. 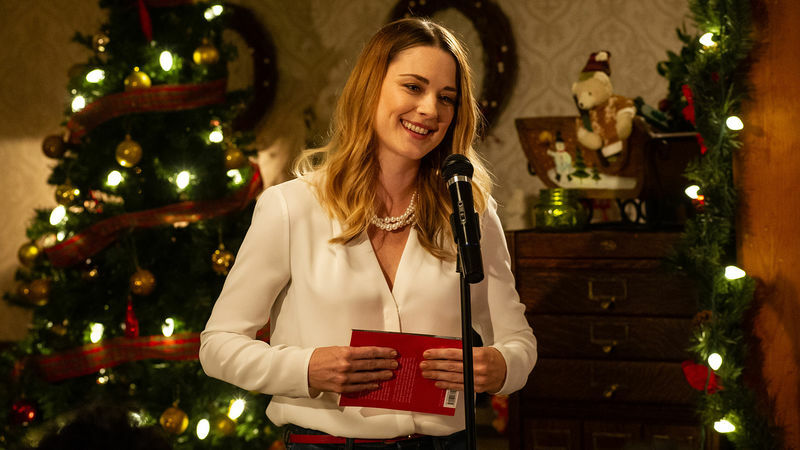 Claire (Alexandra Breckenridge), a savvy venture capitalist from New York City, escapes to a quaint town in Vermont for the holidays and becomes a guest of the Fortenbury Bookstore. Upon arrival, Claire finds Christmas celebrations have been canceled by the town after a flood and the bookstore is in a dire state of disrepair. She immediately takes on the challenge to revitalize the store, but clashes with the owner, Andrew (Jamie Spilchuk), who initially rejects all her proposed improvements. Eventually, sparks fly as the two begin a budding romance, and Claire’s infectious optimism inspires Andrew to join her in reviving the yuletide spirit. But everything comes to a screeching halt when Claire discovers that Andrew is planning to sell the bookstore in the New Year. Will the spirit of Christmas be enough to change Andrew’s mind and encourage him to follow his heart?